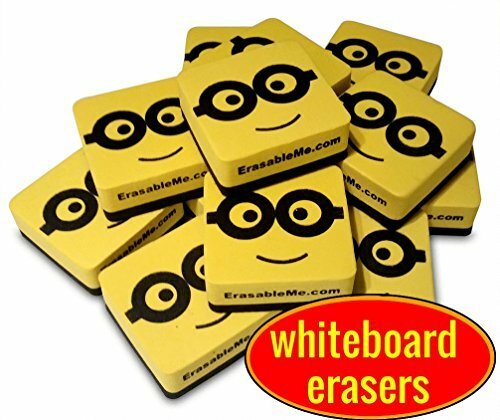 Magnetic Whiteboard Dry Eraser Set - (12) Pack - Best PREMIUM Quality Erasers with BONUS - 100% Guarantee! - Strong Magnet Sticks to Dry Erase White Boards For Home, Office & School- UPDATED DESIGN! ✔ LIMITED EDITION ● 2" × 2" Magnetic whiteboard erasers ● perfect for those little hands and all dry erase boards. ✔ LIGHTWEIGHT AND SMALL ● easily transports in your pocket, bag, purse, briefcase or pencil case. Sticks to all 'MAGNETIC' whiteboards, filing cabinets, refrigerators, dry erase boards and most 'magnetic' calendars! ✔ DURABLE AND LONG LASTING ● Erasable Me erasers clean easily with mild soap and water. Non-toxic and Eco friendly! These PREMIUM erasers are made to last by using quality material.